I enjoy one touch controls as they're simple enough to use, but difficult to master. 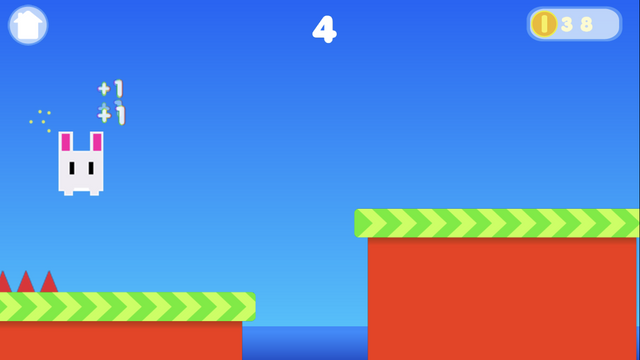 As your score and distance increases, so does the variety of obstacles and environments. Collect coins to unlock pals! Hey Squeeb I got your pm. Please go ahead and use it! The point of trying to get it to work is so others can use it. It's a valuable resource and getting it updated was very awesome of SadiQ. Here's the link. It should be the "water test behavior". If you can modify it to get the water drops to integrate with the water that'd be amazeballs. Thanks to Luyren, a nice Goomba behavior was created so that the Goomba would switch directions when it reached the edge of the platform and would also keep up with the Speed that the platform was moving. Very happy with the way it turned out. I also took out the score system. Before, the score would go up everytime the player clicked or touched the screen but it felt forced and it seemed like something that could be abused and overwall not as rewarding...I have now switched it to be distance based as I feel this is a better way of scoring for this game. It decrements wayy to fast but I'm working on it. I tried dividing it but in order to eliminate decimals I had to use "round" and divide by 100 to keep it clean. Can't wait to start doing the real art. -Ads currently work. Looking into chartboost. The score currently increments too fast so if anyone knows how I can have it set to increment slowly or in metrics (meters) that would be nice as the games difficulty is based on the score. I like the character art! I have an extension I'll release here in a few days , it will let you play In portrait and landscape depending on how you hold device as you play. Download for donation. There are the number tweens, too--but I prefer to write it myself so I can easily adjust the behavior to my liking. In my example, the gain is 1/17 of the difference each frame, with a minimum gain of 43. I picked a prime number for the minimum gain so that the units digit displays all the digits, even though the score may always be a multiple of 10 or 100. Based on the size of the hoppers, I'd estimate a meter to be anywhere from 15 pixels wide (scaled for the cow) to 50 (scaled to the rabbit). Taking the middle route, maybe divide the score by 32? Increment by 1/32 instead of 1, and round the display but keep the decimals internally. I like the character art! But I'm not sure if the style aligns with that of the background. Some of the characters seem pixelated, but the background and clouds are smooth. I think I prefer the smoother look. I'm not home now but I'll have to show you the code I'm working with for scoring but I'll definitely give this a go. The art is mostly placeholders. The background,clouds, platforms are all open game art assets. Characters I'm still working on but I'm hoping to get a good pixely cohesion going on soon with everything. I tried to work with smoother art but I wasn't able to get it to a point where I was happy but Stay Tuned! I'm psyched for those posters though Merrak! Here's what I have for the score increment. 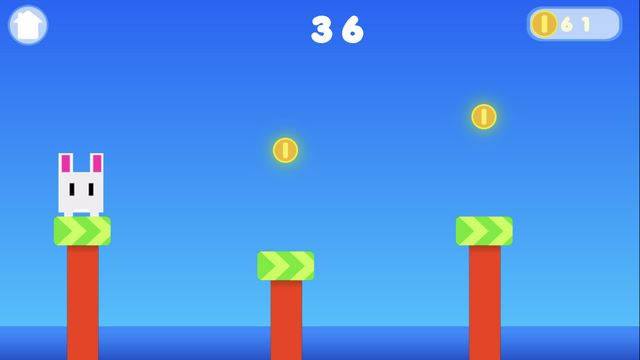 It essentially increments whenever the player is in the air (since they're not actually moving). It increments, but it's just wayyy too much as I'm looking for something more like jetpack joyride. I tried dividing by 10 and it gives me a smaller value but it's so precise that it gives me an extraneous amount of decimals. Not quite sure what you meant by separating the scores though? Code is attached. I can't see your code. I just get a big blank image. But your numbers will be small enough after after dividing that I don't think you'll need anything elaborate like I set up. Just rounding like squeeb suggested should be enough to smooth it out. I would simplify the score. 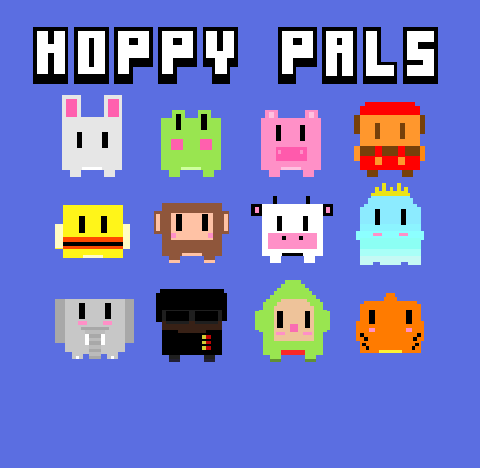 I think there is value in nice clean scores, So you can say to a friend, I got 20 in Hoppy Pals instead of, I got 746 in Hoppy pals, small numbers are easier to remember. I would either have a little flag on each platform and when you pass it you get 1 point or just count score every time you land on a new platform. I think you have the right blocks, but in the wrong order. Rounding should take place after division, not before. Then you can divide by a value larger than 1. I didn't notice that the player only receives points when they're in the air, but now I see it in the GIFs you showed us. That's an interesting way to do the score, although I also think it's a bit counter-intuitive. I think having coins or flags would be more obvious to the player. I don't think you need the x1 block. Rounding after dividing and raising the divisor should fix the display problem. It had originally crossed my mind to make the scoring system based on when you landed on a platform/flags like you guys have suggested, but I wanted to go for the distance scoring as it reminded me more of Jetpak Joyride and I thought by constantly upping the score like this, it would make the player feel constantly rewarded but now that you guys mention it, I think scoring the way you guys have sugggested might be a little better. Colber and Merrak, you make a good point about simplifying things. Saying you got a score of 20, flows better than 734. I think distance scoring would be more appropriate if this game was a constant runner. Thanks for the feedback...off to add flags! My only other question would be...if I were to simplify the scores, how could I also keep the difficulty curve nice and neat? In my current build, the difficulty ramps up every 500-1000 points, so by lessening the score to increment per platform, does that mean my game will be inherently more difficulty? I'm trying to find the sweet spot but at what point does the game reach it's hardest without being unfair. I don't want to keep introducing new obstacles if I feel the player is just going to get frustrated with the abundance of obstacles...kind of a subjective set of questions but I'm going to ask them anyway as you guys (especially Colbert) understand mobile better than I do. Should there be a point at which most players reach a threshold of difficulty that is made to end the game?